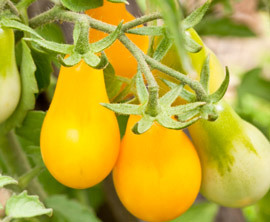 The 2-inch long Yellow Pear Tomato is an old heirloom variety that is very popular among home gardeners and makes a colorful addition to a salad. The taste has been described variously as tangy, to sweet and mild, to bland. Some people say they're mealy tasting but others say they're delicious, so results may vary! Generally speaking yellow tomatoes are lower in acid content than red tomatoes and can therefore be gentler on the stomach for those with acid-sensitivity. These tomato plants are prolific producers and can easily reach over 6 feet tall so they will benefit from staking or caging. I recommend buying Yellow Pear tomato seeds at TomatoFest because not only do they specialize in heirloom tomato seeds that are certified organic, but their service is great and their staff friendly.